I woke up last Sunday to a beautiful blue clear sky and a sleeping family. 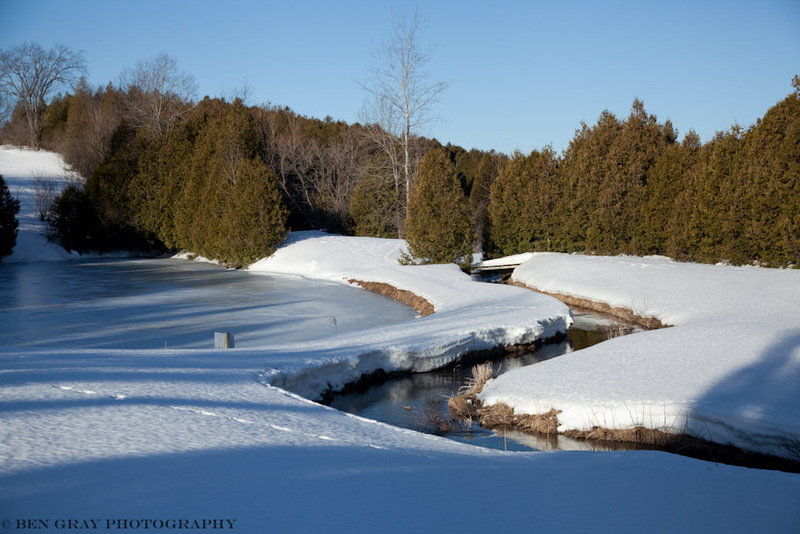 So I grabbed my camera and a pair of snow shoes, before heading out to the golf course. 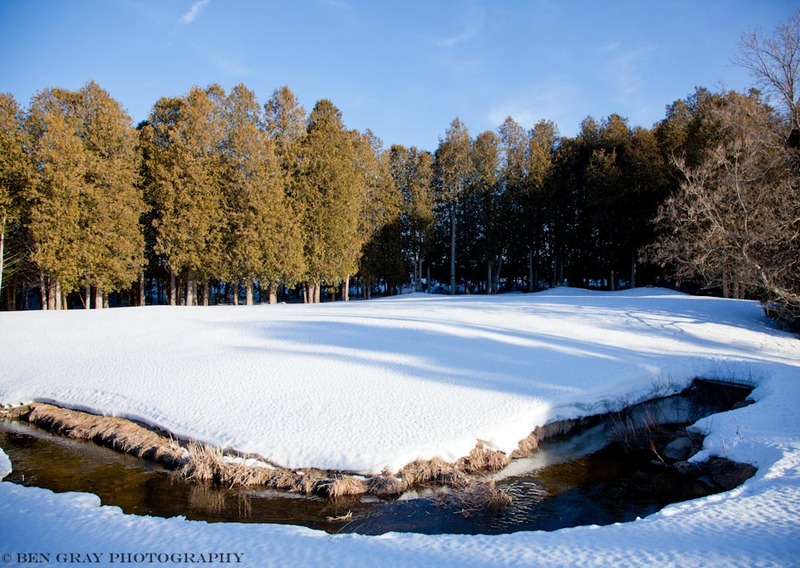 The fairways directly across from us don’t offer much protection from extreme weather conditions. 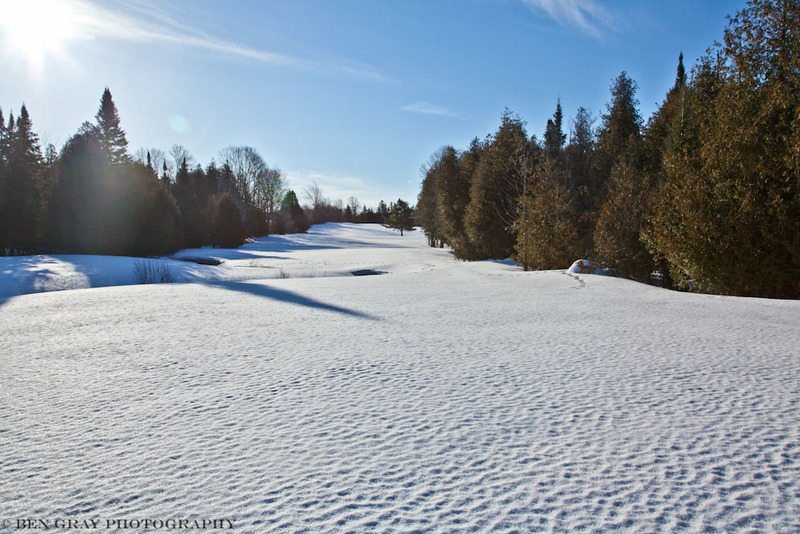 Therefore, it’s been difficult this winter to venture much further than a 100 metres onto the course without facing deep snow and bitterly cold winds. Today the weather was more on my side. I entered the course at the North end, the furthest from the closed clubhouse. I quickly found myself in new territory, and I carefully proceeded down into the gully. I say carefully because I was unfamiliar with my surroundings. The gully was encircled by trees, there were no signs of human tracks, and it was difficult to hear anything over the crunch of my snow shoes in the icy conditions, so I would pause intermittently to listen. As I approached the base of the gully, the path narrowed and wound tightly through the trees. I was very conscious of the moment when I stepped out of the sun and into the shadows of the trees. From nowhere, a snow shoe imprint other than my own appeared. It was at least a few days old, but I thought it was strange I hadn’t noticed any leading up to the path. 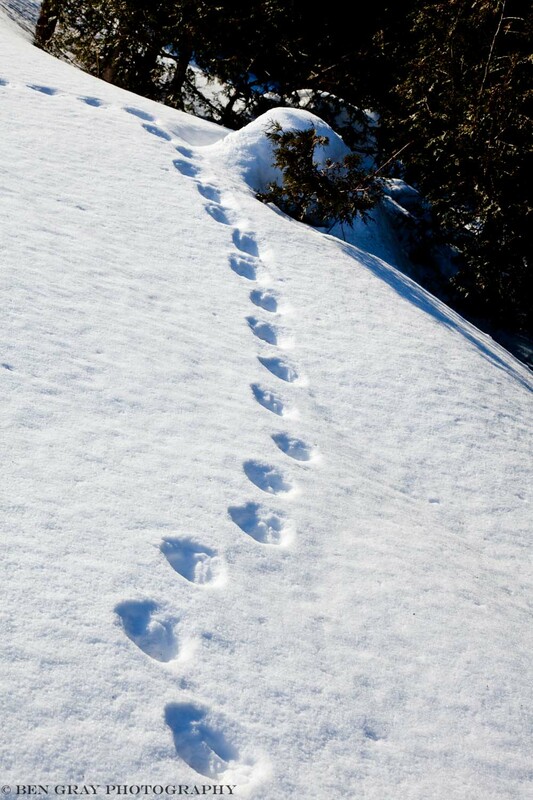 The previous human had a companion, with little paw prints alongside their own. Not too far ahead the prints were gone as quickly as they’d appeared, so perhaps they were older than I thought, or maybe the trees had protected the prints against the recent snow fall. Stepping back out into the open was like being teleported into a new world; the morning sun once again streamed down. 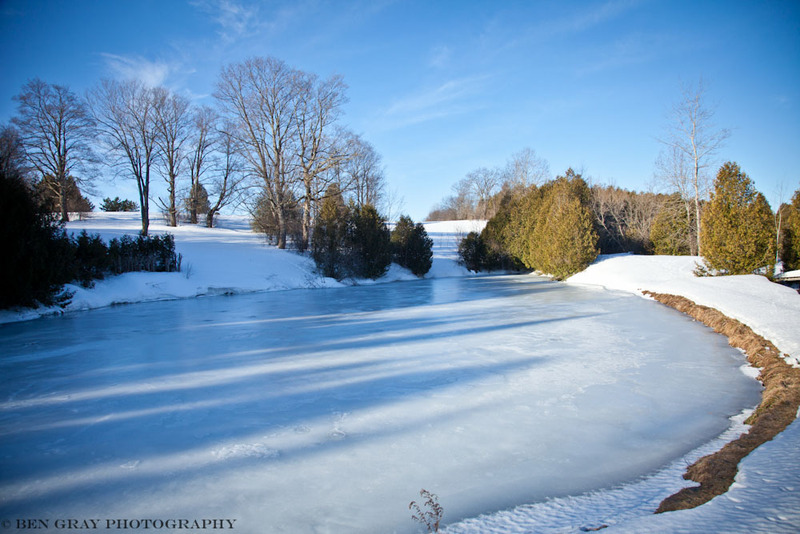 On my right there was a large frozen pond, and on my left, a winding running stream. I had a feeling of solitude as my surroundings offered complete silence and the sense of remoteness. For this brief moment, there wasn’t even the sound of birds waking up. Now this would be a good place to do yoga – a distinct difference to doing it at home with two kids! As I rounded the corner, I stared up at a long fairway. I assumed that this was the back of the golf course, as the left hand side was densely lined with trees. At first, I smiled at the tranquility. That was until I noticed the large animal prints that meandered out of the bush, around the small stream, and out the far side of the golf course. It was at this point that I realised that no one knew where I was. I recalled that there’d been a bear sighting in this Grey County town last summer. I laughed at how people always thought Australia was a dangerous place with our little spiders 😉 and sharks, but North America has a lot more land animals . . . that move fast. Off the top of my head I could think of a few: coyotes, wolves, lynx, and cougars. Instinctually, I moved to the centre of the golf course, and walked slowly towards the prints. At this stage I’m pretty sure that these are too big for a coyote, wolf or lynx. 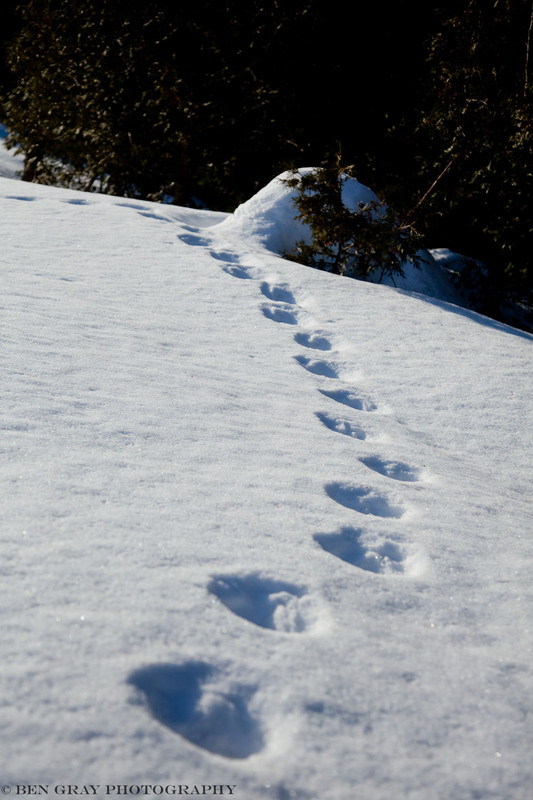 The pattern appeared to show an animal placing one foot in front of the other, so it wouldn’t be a bear. From my limited knowledge, they were too round for a moose. Could they be from a cougar? At this stage on my walk, I didn’t know anything about cougars and it’s probably best that I didn’t. Further reading suggests that although they are reclusive by nature, they can jump 20ft (vertically), they travel above 50km per hour, they can pounce up to 40ft, and it’s been a very long winter . . . it was probably hungry. I’m no animal print expert, so perhaps it was an oversized beaver bouncing along, but my gut was telling me at the time that I really didn’t want to come face to face with whatever made those prints. So I’ll put it out there, does anyone know what made these prints?